The battles fought at the Rear Line on the Karelian Isthmus in March were exacting. Peace negotiations also contributed to the requirements set for the frontline troops by the military commands of both countries. The Finnish military command required the troops at the front lines to hold their positions, while the Soviet military command demanded impressive victories, starting with the fall of Viipuri. As a consequence of the withdrawal of Öhquist’s corps (II C) and Laatikainen’s corps (I C), the front defended by Talvela’s corps (III C) at the Vuoksi (Vuoksa) River expanded to the Äyräpää (Baryshevo)–Vuosalmi area. The 2nd Division (2nd D), which was commanded by Jaeger Officer, Colonel Eino Koskimies and which had previously belonged to Laatikainen’s corps (I C), was subordinated to Talvela’s corps. The army (7th A) commanded by Army Commander 2nd Rank Meretskov had started its attack on the Interim Line on 28 February. It was stopped at the Rear Line by the Army of the Isthmus on 1 March. On the late evening of 1 March, Meretskov issued an order for the army to seize Viipuri (Vyborg) the following day and advance across Vyborg Bay. Öhquist’s corps (II C) had three divisions (3rd D, 5th D and 23rd D) in position at the Rear Line. They were attacked by the 34th Rifle Corps, which had been ordered to take Viipuri, as well as two other rifle corps (50th RC and 19th RC) from the northeast side of Viipuri. Laatikainen’s corps (I C) commanded the division of (1st D) Jaeger Officer, Colonel Martola and Group Sihvo at the front between the Vuoksi River and Tali (Paltsevo). The latter was a reinforced brigade. The area defended by Laatikainen’s corps was attacked by one of the rifle corps (23rd RC) of the 13th Army, which was commanded by Grendal. Its other rifle corps launched an attack in the Äyräpää area with the mission of advancing across the Vuoksi River to Vuosalmi and attacking the rear of Talvela’s corps (III C). On 2 March, the 10th Rifle Corps launched the first stage of the offensive across Vyborg Bay. The goal was to occupy the islands in Vyborg Bay. The 28th Rifle Corps launched its attack near the mouth of Vyborg Bay on 4 March. Öhquist wanted to rest Colonel Paalu, who commanded the 3rd Division, which had been in charge of defending Viipuri. The command of the division was planned to be assigned to the chief of police of the Helsinki Police Department, Jaeger Officer, Colonel Johan Arajuuri, but Arajuuri shunned having to take responsibility for defending Viipuri. Ultimately, the commander of the 4th Division, Jaeger Officer, Colonel Antero Kaila, was assigned to command the 3rd Division. Arajuuri replaced Kaila as commander of the 4th Division. The order on the change in command was issued on 1 March. On the last day of February, the Viipuri Coastal Sector was formed on the northern shore of Vyborg Bay. It was renamed Coastal Group on 1 March. It comprised one division (4th D) and the Viipuri Sector. Jaeger Officer, Major General K. M. Wallenius, who had been appointed the group’s commander, took up his duties on the evening of 1 March. Wallenius came to Vyborg Bay from Lapland, where he had served as commander of the Lapland Group. His former position had been filled by Swedish Lieutenant General Ernst Linder, who had first served as a volunteer in Finland during the Civil War of 1918. The commander-in-chief dismissed Wallenius from the post of the commander of the Coastal Group on 3 March. Mannerheim appointed the chief of the General Staff at the General Headquarters, Jaeger Officer, Lieutenant General Lennart Oesch, as the new commander of the Coastal Group. More troops were transferred to the Coastal Group during the fighting, including the 9th Infantry Regiment from the Viipuri area, the Cavalry Brigade from Ladoga Karelia and the from Lapland. The enemy attack across Vyborg Bay with six divisions came as a surprise to the Finnish forces. The situation became the most critical in the areas of the Häränpäänniemi and Vilaniemi Peninsulas. The enemy gained a foothold on the northern shore on 4 March, i.e. the first day of their attack. The following day, the enemy vanguard that had reached the Vilaniemi Peninsula advanced to the road between Hamina and Viipuri. The counterattacks launched by the Coastal Group to destroy the enemy bridgehead were unsuccessful. The area of responsibility of the Coastal Group, commanded by Oesch, was reduced to the area east of the Häränpäänniemi Peninsula. The Hamina Group was established as a new command echelon under the General Headquarters on 7 March. Its area of responsibility on the coast extended from the Häränpäänniemi Peninsula to Kotka. Jaeger Officer, Major General Edvard Hanell was appointed commander of the Hamina Group. The group’s headquarters was formed from the Cavalry Brigade Headquarters. In addition to the coastal troops deployed within its area of responsibility, the Hamina Group also assumed command of the Coastal Group’s other troops within its area of responsibility, such as the Cavalry Brigade and the 40th Infantry Regiment. The troops deployed at the Häränpäänniemi Peninsula and the area north of it were formed into Battle Group Paalu. Colonel Paalu, who had been relieved from the role of commander of the 3rd Division, was appointed the battle group’s commander. The 28th Rifle Corps, commanded by Brigade Commander Pavel A. Kurochkin, had one rifle division (70th RD) and two motorised divisions (86th MoD and 173rd MoD) at its disposal at the bridgehead. Their attacks were intended to expand the seized bridgehead. The Soviets were able to advance bit by bit but were unable to actually break through the positions of the Finnish forces that constrained the bridgehead. The Uuras Islands, which were located at the same end of the Coastal Group’s defensive area as Viipuri, belonged to the main defensive line. Finnish troops held their positions on the islands against attacks by the 10th Rifle Corps (10 RC) from 2 to 7 March. A few more days were subsequently spent in battle over the control of the islands. Finnish forces lost the islands but halted the enemy advance near the shoreline of the northern shore of Vyborg Bay. The 3rd Division, which had been transferred under Colonel Kaila’s command on 2 March, was positioned at the edge of the city, where it repelled daily attacks by the enemy, with the exception of the area east of Käremänlahti (Zakrytaya Bay), which was lost in the first attack by the enemy on 2 March. Meretskov’s army (7th A) issued a new attack order in the early evening of 9 March. The 34th Rifle Corps, which attacked in the Viipuri area, and the 50th Rifle Corps, which attacked on the northeast side of the city, spent two days preparing their attack. The former had four rifle divisions at its disposal, while the latter had three. One rifle division (7th RD) of the 34th Rifle Corps attacked in the area of the city of Viipuri. 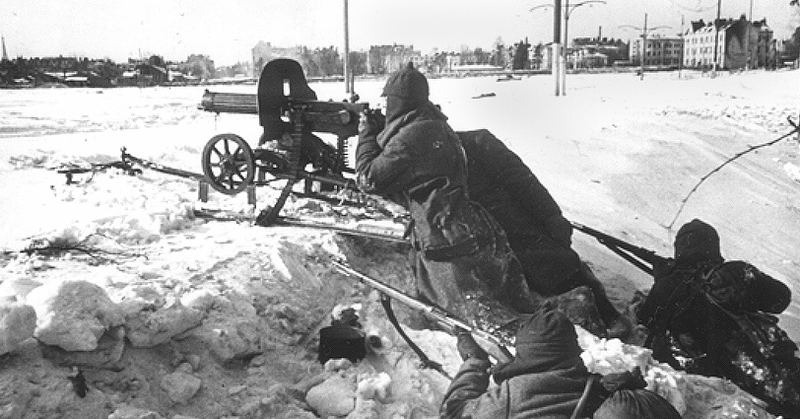 A machine gun of the Northern Front at the front line in Viipuri at 10am Russian time on 13 March 1940, i.e. a few hours before the peace treaty entered into force. Image via Juri Kilin. On 12 March, Commander Erik Heinrichs of the Army of the Isthmus permitted Öhquist to withdraw to the support line in Viipuri. The commander of the army corps immediately ordered Kaila to relocate the 3rd Division’s main defensive position to Patterinmäki (Batareinaya Gora) in the evening. This new defensive position was still held by the division’s troops when hostilities ceased at 11am on 13 March. The front extending from Viipuri’s suburb of Karjala to Lake Kärstilänjärvi (Krasnokholmskoye) in the northeast was defended by the 5th Division, commanded by Jaeger Officer, Colonel Isakson. The majority of the 34th Rifle Corps’ forces launched an attack in this area. The Finns were able to repel the enemy’s prepared attack, which had started on 11 March, but with heavy casualties. The Tali area, located to the left of the area defended by Isakson’s division, was defended by the 23rd Division, which was commanded by Jaeger Officer, Colonel Oinonen. Its front line was breached by the 50th Rifle Corps in the attack that started on 11 March. The vanguard of the enemy forces that had achieved the breakthrough was stopped in the area of the Portinhoikka intersection. The rear position of the III Corps (III C) along the Vuoksi River was extended to Vuosalmi, where the new main defensive position was situated on the opposite bank of the river, on the ridge of Äyräpää in Kylä-Paakkola. The position was defended by Koskimies’ division (2nd D), which had been subordinated to Talvela’s corps (III C) from Laatikainen’s corps (I C). Two divisions (7th D and 8th D) were in defensive positions along the water line formed by the Vuoksi River, Lake Suvanto (Sukhodolskoye) and the Taipale (Burnaya) River in the area between Vuosalmi and Taipale (Solovyovo). One division (21st D) was also stationed in the corps’ area as the commander-in-chief’s reserve, having been transferred to the field army from the Home Troops in January. It was commanded by Colonel Niilo Hersalo. It was short by one infantry regiment, which had been transferred to the area defended by the II Corps on 14 February. The General Headquarters and the III Corps intended to have Hersalo’s division take charge of the front in the Taipale area and transfer the division (7th D) commanded by Jaeger Officer, Colonel Einar Vihma behind the front lines as the commander-in-chief’s reserve. This transfer was only partly carried out. The regiments and battalions of the two divisions took turns defending the front and being in reserve. The divisions’ commanders also temporarily switched positions on 25 February. In the first days of March, the fighting seemed to subside in Taipale, at least momentarily. 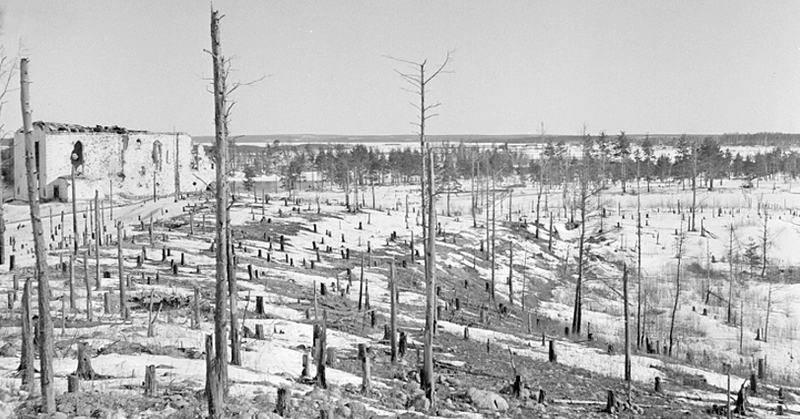 A photo taken during the Continuation War (1941–44) from the ridge of Äyräpää, overlooking Äyräpää Church. SA-kuva. defended by the 2nd Division (2nd D) in Äyräpää. In this area, the Soviets launched an attack on 3 March that led to the occupation of the Äyräpää church hill and the island of Vuoksi in front of it. Talvela’s army corps (III C) transferred Hersalo’s division (21st D) from Taipale to Vuosalmi. It had two infantry regiments at its disposal. The division took charge of the front in the Vuosalmi sector, defended by Koskimies’ division (2nd D), and it simultaneously gained command of another infantry regiment. The Soviets continued their attempts to reach the opposite bank of the Vuoksi River. On 11 March, they succeeded in seizing a bridgehead, approximately half a kilometre in depth, in the Vuosalmi area. The following day, the commander of the III Corps, Major General Paavo Talvela, decided to withdraw the troops in the Vuosalmi area to the support line. However, the commander did not have time to issue the order before the war ended on 13 March.